Duro Dyne | HVAC Machinery | Cincinnati Precision Machinery, Inc. Innovation United With Performance. Unsurpassed R&D for new products and processes, utilizing the latest technologies. 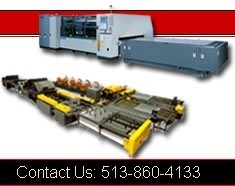 Duro Dynes engineers are always tasked with the improvement of shop and field production. Know What Matters. A commitment to safety, economy and versatility. Ease of use, installation, maintainenance and service. Duro Dyne produce lasting, structurally sound product for HVAC commercial and residential use. Maintain Control. Duro Dyne Family owned and managed. Staff engineering. Established in 1952, Duro Dyne Corporation has evolved into the leading manufacturer of sheet metal accessories and equipment for the heating, ventilating, and air conditioning industry. Over the span of the last 50 years, Duro Dyne has expanded its plant locations and now employs over 200 people. Duro Dyne’s extensive research and development program has introduced more new products and processes than any other company in our field. Such things as Flexible Duct Connector, as we know it today, as well as Vane Rail and Blade Kits for multi-blade dampers were originally developed and patented by Duro Dyne Corporation. Other products that have now become standards in the sheet metal fabrication field were developed by Duro Dyne Corporation as well. In the fastening field Duro Dyne introduced the concept of self-drilling sheet metal screws. Quieturn Turning Vanes and Glasline Hardware for fiberglass duct systems all were originated by Duro Dyne. Due to the increasing number of diverse items in our product line, Duro Dyne found it necessary to divide into the Duro Dyne Supply Division, DuroZone Division, Machinery Division, Duro Dyne Tool Division, Dyn-O-Mate and Dyna-Tite Divisions. 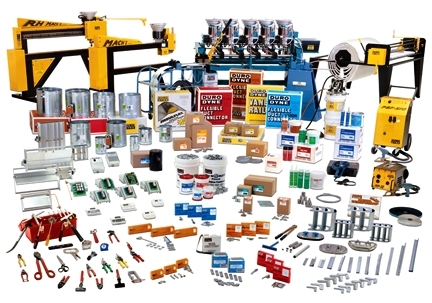 Our Supply Division continues to offer such familiar standards as Flexible Duct Connector, Insulation Fasteners, Screws and Rivets, Adhesives and Sealers, and Air Regulation Hardware. We continue to investigate new and innovative solutions for improving shop and field production. Our Spec-Seal Regulators and Side Glide Damper System parts are the latest innovations from this Division. The DuroZone Division has made dramatic breakthroughs in Zone Control System designs. DuroZone provides cost effective and versatile methods of Zoning for residential and light commercial installation. DuroZone’s staff of “in-house” engineers is continually researching the latest technological breakthroughs assuring the best products for today as well as tomorrow’s markets. Duro Dyne’s Machinery Division is most noteworthy for the tremendous contribution in the field of insulation fastening...from the first hand held Pinspotter to the FGMH Auto Shift Multi-Head Pinspotter System used by some of the largest contracting shops in the world today. In addition to the finest Pinspotting equipment, Duro Dyne’s Machinery Division continues to manufacture the finest Insulation Cutting Equipment, Portable Spotwelders, Water Based Adhesive Application System and Turning Vane Fabricating Equipment. Quality and workmanship have always been of prime importance for the manufacture of our equipment. Duro Dyne's marketing expertise and Dyn-O-Mate’s engineered designs combine to bring the finest 4-bolt duct connection system to the market. In the same vein, our Dyna-Tite Division brings the HVAC Industry an innovative hanging system that eliminates the costly need for threaded rod. Duro Dyne Corporation does not stop here, for we continue to probe areas in which we could be of greater service. We trust that you will call on us if you have any suggestions as to how we may serve you better.